You live a fast-paced and over-scheduled life. You don't always find time to get the necessary things done. You wonder how you're going to add "faith formation" on top of everything else. 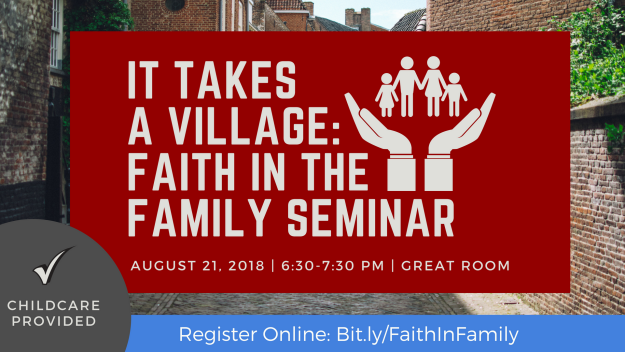 On Friday, September 21, we will discuss not just the importance of nurturing our children and families in the faith but also some concrete next steps and best practices--as well as some potential pitfalls to avoid. This seminar is designed especially for families expecting children all the way up through families with high school students. This is NOT a gathering for people who have it all together. This is NOT a place to come and find an easy fix. This is NOT a time to come impress friends and strangers with how great your family devotions are or how well-behaved your kids are in church. This IS a gathering, a place, and a time to experience life together and grow in love and support with our community of believers and to get some concrete simple next steps. Even if you don't, won't, or can't have children, you're invited to come participate, be part of the conversation, and see how God is calling and equipping you as a crucial part of our family of faith as we support one another in nurturing the children and youth that God has entrusted to our care. Come fed, and stay for ice cream! -Kids of all ages will play in Malkow Hall (with supervision). -Grown-ups will gather in the Worship Center. make some new connections with people who want to support you.